These days, it’s tough to find anyone who does not have a powerful, network enabled mobile device or smart phone tethered to their hip. Mobile phones and tablet computers are tools that keep us connected to our social and professional communities, and promote ever increasing productivity. An increase in reachability has brought with it a standard of near real time response to emails and reporting requests. 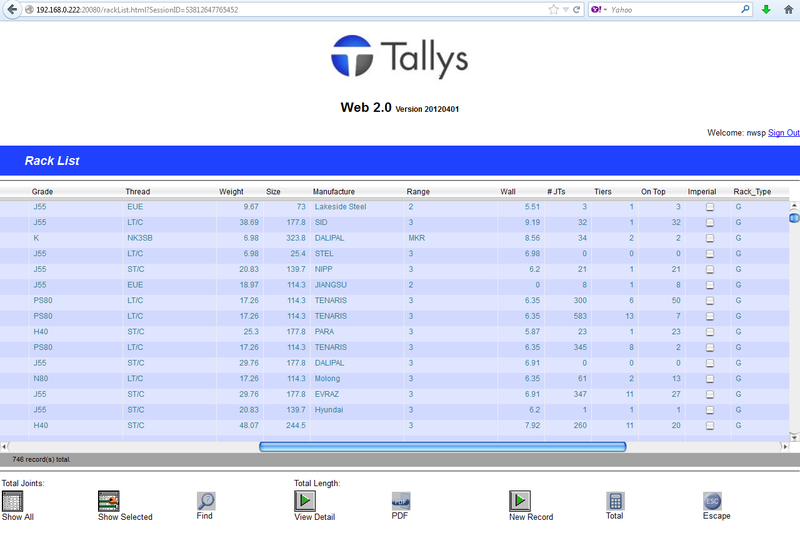 The Tallys Web Module is an add on which makes OCTG movements and customer specific reporting available 24/7 from any device with an internet connection. Your customers will appreciate the security and convenience of having quick and on-demand access to their order history and movements. Providing your customers with exclusive access to view and report on your real-time inventory levels remotely will drastically reduce the number of phone calls and email queries for inventory reports. The Tallys Web Module can eliminate the need to fax or transmit lengthy month-end movement reports, which allows your staff to spend their time more productively running your business. The web module allows your owners to browse Tallies, StockCards, Racks, Equipment, Dispatches, Shipments and Invoices that belong to them. It also allows them to PDF and print related reports remotely. Below is a screenshot of a Rack List, when viewed via the web. From this screen, customers can definitions, counts, and lengths available in real time. Follow us on Twitter, and ‘Like’ us on Facebook to keep up to date with the news at NWSP and be among the first to take advantage of ongoing Tallys related research and development.